California Lawyers for the Arts - Getting Permission: How to License & Clear Copyrighted Materials Online & Off -- SPECIAL AUTHOR EVENT! Getting Permission: How to License & Clear Copyrighted Materials Online & Off -- SPECIAL AUTHOR EVENT! 25% discount off cover price -- a $10 savings. Richard Stim will personally sign your copy of the book at the event. Click JOIN C.L.A. on the left-hand menu bar to access Member discounts for this and all other workshops and events! Richard Stim will personally sign your copy of the book at the event. 35% discount off cover price -- a $14 savings. Richard Stim will personally sign your copy of the book at the event. Bring Student ID and Driver's Licence for check-in. Click JOIN C.L.A. on the left-hand menu bar to access Member discounts for this and all other workshops and events! Your admission price includes a signed copy of the book! If you plan to use any copyrighted material for your own purposes, you need to get permission first from the owners of that work. If you don't, you could find yourself slapped with an expensive and time-consuming lawsuit. This workshop explains the permissions process including whom to ask for permission, as well as when -- and how much to expect -- to pay for permission. Rich Stim will autograph copies of your book following the workshop! 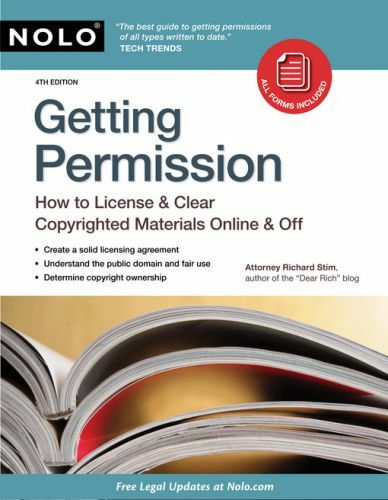 Your price of admission includes a signed copy of Getting Permission which includes a valuable CD-ROM with agreements for acquiring authorization to use text, photographs, artwork, and music, whether it's found online or off. The 4th edition of Getting Permission essential guide is completely updated to reflect the latest laws and court decisions. Plus, read an all-new collection of practical, real-life FAQs, based on author Richard Stim's popular intellectual property blog, Dear Rich, Nolo's Patent, Copyright & Trademark Blog. ncalegal@calawyersforthearts.org. Include "Richard Stim Event" in the subject line of your email message.